The Lord of the temple is praised by Saint Tirumangai Azhwar in his Mangalasasanam hymns. Appearing in various colours, Azhwar asks Lord what his real colour is – white as milk, dark as a cloud, glittering as gold or that of precious gem, will you tell me my Lord in Indalur. Being one among the celebrated Divya Desas, the temple with its five tier Rajagopuram is built on a land area measuring 350 feet in length and 230 feet in breadth. Planet Moon got relieved of his curse here after a bath in the sacred spring. Chandra-Moon worships the face of the Lord, Sun the feet and Lord Brahmma the naval. Mother Cauvery worships Perumal on His head side while Mother Ganga His feet. Yama and Ambarishan also worship the Lord at His feet. Mother Cauvery has greater importance in this place than Mother Ganga. The history of the temple speaks the greatness of Ekadasi Vrata-fasting, that is the devotee committed to this prayer should spend the whole day only with thoughts of Lord without consuming even a drop of water. King Ambarishan was following this practice meticulously. The devotee should take food only the next day-Dwadasi the 12th day of New Moon or Full moon at an auspicious time. And that was the 100th Ekadasi-Dwadasi for king Ambarisha. People of his country and those in the palace were happy that their king will be completing a century and there were necessary arrangements for the celebrations. But, people in the celestial world were unhappy because, Ambarishan may be elevated to their status if his 100th fasting went successfully. They did not want to lose their position for a human. They approached Sage Durvasa to undo his fasting and help retaining their positions. The sage, noted for his temperament assured the Devas to help them and came down to earth. By then, the king had finished the Ekadasi fasting. The fasting would become complete only if he took his food before the prescribed time the next day-Dwadasi. If the time ends, the fruits of the fasting also would be lost. The king did not know that the sage had come with an evil plan. The king was about to take his food when Sage Durvasa entered his palace. The king was doubly glad to have a guest in Sage Durvasa and requested him to accept his hospitality-dining with him. The sage cunningly told him that he accepted his invitation and would be back to be with him for the lunch after a bath in the river. His plan was to fail the king. The time was fast nearing. The king was afraid of the curse of the sage if he ate without him. He consulted the pandits in his court. The chief pandit said that if he simply consumes of few drops of water, he would complete the fasting in order. King did this and was waiting for the sage to have the full food. Knowing this through his powers, Durvasa created a ghost to kill the king. When the ghost began chasing him, Ambarisha sought asylum at Lord’s feet. Perumal looked at the ghost angrily. The ghost began to retreat and disappeared. Realizing the devotion of the king and the power of his fasting, sage Durvasa sought the pardon of the Lord. The sage was pardoned. When asked by the Lord of his wish after completing 100 Ekadasi fastings, king Ambarisha begged the Lord that He should stay at this place and bless the devotees. Pleased with the king’s request, Lord Vishnu-Perumal is blessing His devotees from this temple as Parimala Ranganathar. Another story goes that Chandran (Moon God) fell in love with his preceptor Brihaspati’s wife Tara and eloped with her, in the absence of his Guru. When Brihaspati found his wife missing, he sought the help of Brahmma who asked Tara to return to her husband. Later, when Tara’s pregnancy came to light, a furious Brihaspati cursed Chandra to deformity saying that the biggest sin of life is to caste one’s eyes on another’s spouse and that Chandran would have to undergo the full severity of the curse for having cast his eyes wrongfully on another's wife. Another story goes that Dakshan was so taken in by Chandran’s handsome features that he decided to make him the suitor for his 27daughters. However, Chandran was interested only in one of the daughters, Rohini and mockingly ignored the others. Dakshan found that the handsome looks had made Chandran too arrogant and cursed him to immediately lose his youth and his strong luring features. Repenting for wrongly casting his eye on another man’s wife, Chandran requested Brihaspati to provide him an opportunity for performing parikara that could help him cleanse his grave sins. 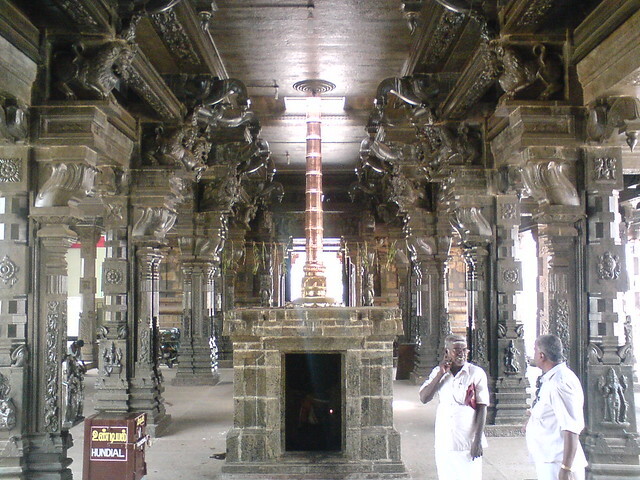 3Phased Parikara: As part of the 3 fold parikara, Chandra undertook penance here at Thiru Indhalur after bathing at the sacred Theertham, invoking the blessings of Lord Vishnu. Answering his prayers, Lord appeared before him and agreed to liberate him from part of the sins. (The story goes that Chandran went to Thalai Changa Naan Mathiyam, another Divya Desam about 15 East of Thiru Indhalur, where he was fully liberated from his curse and dosham). Pleased with being partly liberated from his curse, Chandran (another name of Chandran is Indhu) requested that this place be called Indhalur in his memory. As the temple is noted for its Ekadasi importance, it is suggested that those desirous of undertaking the fasting, may start the practice from this temple. The temple is open from 06:30 a.m. to 11:30 a.m. and from 05:00 p.m. and 08:30 p.m.
Sri Parimala Ranganathar Temple, Tiru Indalur, Nagapattinam district. Priest : Ranga Bhattar / V. Muralidharan Deekshithar / Sridhar Bhattar @ 9443873620 ; 9942916241 ; 98437 31595.
you are doing great work thank you.